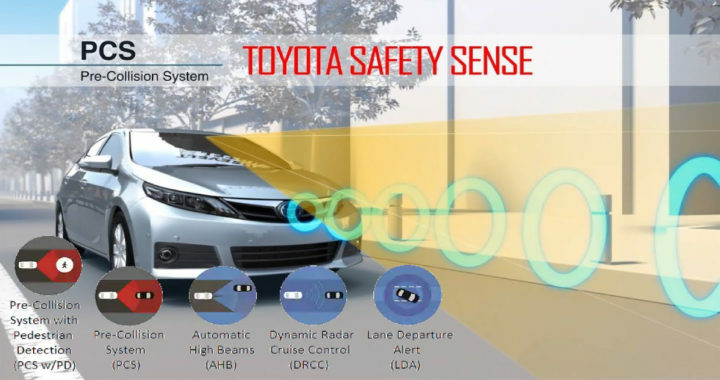 Home » What Is Toyota Safety Sense? TSS is a combination of sensors around the vehicle, working together to provide the safety not just for the driver but for other vehicles and passengers and also now for pedestrians, bikers, and even animals. Intended for highway use and similar to “constant speed” cruise control, Dynamic Radar Cruise Control (DRCC) lets you drive at a preset speed. DRCC uses vehicle-to-vehicle distance control, which adjusts your speed, to help you maintain a preset distance from vehicles ahead of you that are driving at a slower speed. DRCC uses a front-grille-mounted radar and an in-vehicle camera designed to detect vehicles and their distance. If a driver is traveling slower than you, or within your preset range, DRCC will automatically slow your vehicle down without deactivating cruise control. If DRCC determines you need to slow down more, an audio and visual alert notifies you and brakes are applied. When there’s no longer a vehicle driving slower than your preset speed in front of you, DRCC will then accelerate to your preset speed. Available On: Corolla Hatchback and 2019 Rav4. Posted in News and tagged Dynamic Radar Cruise Control in Toyota, what is Lane Tracing Assist, what is Road Sign Assist, What is the Difference Between Toyota Safety Sense C and P and 2.0?, What is the Difference Between Toyota Safety Sense P and 2.0?, What is the Difference Between Toyota Safety Sense Packages?, what is toyota Pre-Collision System, What Is Toyota Safety Sense.